This display was created at an antique show, but shops and shows are sometimes the best places to be inspired about decorating for your own home. 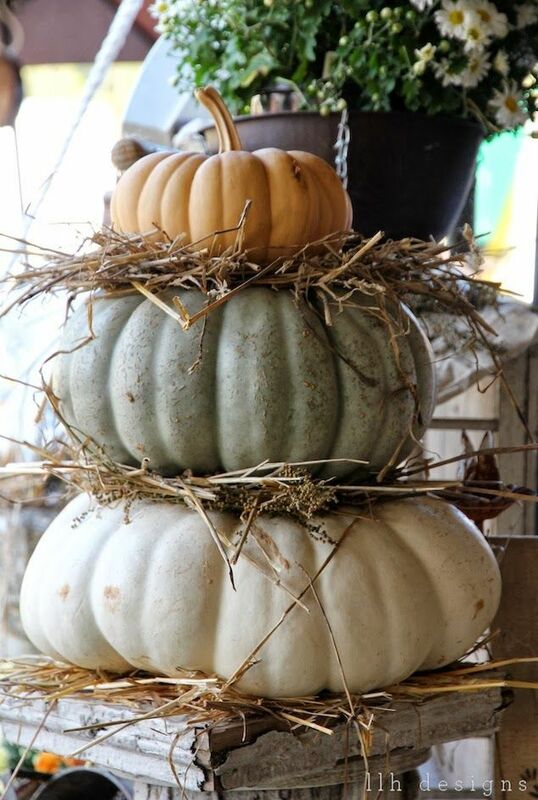 The stack is sitting on a short column and was created by stacking three different colored pumpkins with hay between them. You could also rest a stack in an urn or a bucket or on a table or bench. 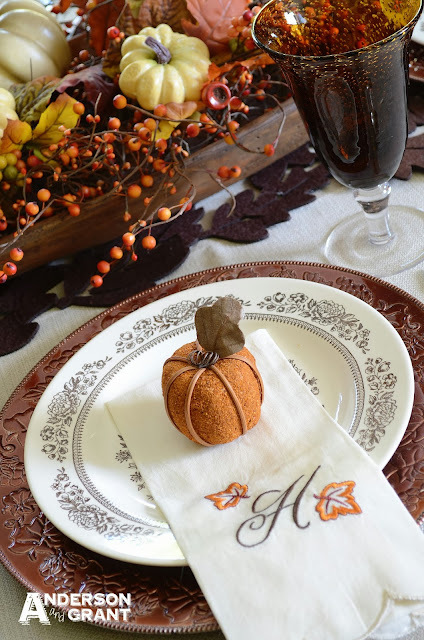 Last fall, I used pumpkins to decorate my guests' plates for a fall dinner. It is always nice to give your guests a little something to take home with them and it is also a great way to spread your decor throughout the table! What could be more welcoming to someone walking up to your home? 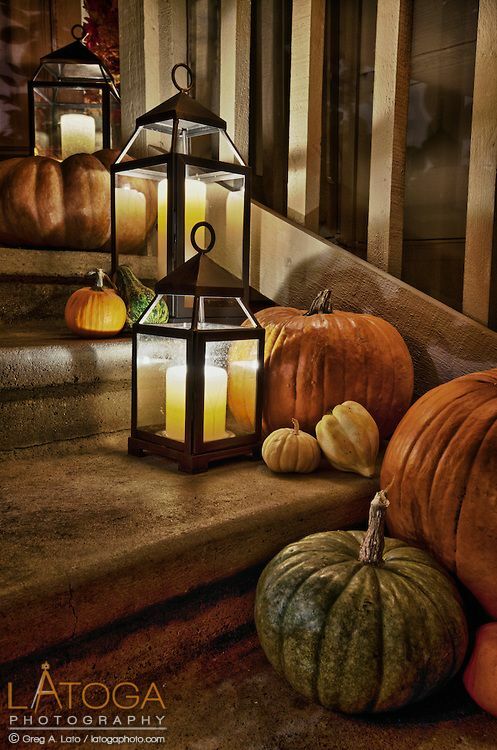 Lining the steps with pumpkins looks great during the day. But the addition of the lanterns carries the look into the evening as well. This could also be done inside your house on the steps to your second floor or basement. A scale makes a perfect place to add a pumpkin or two. 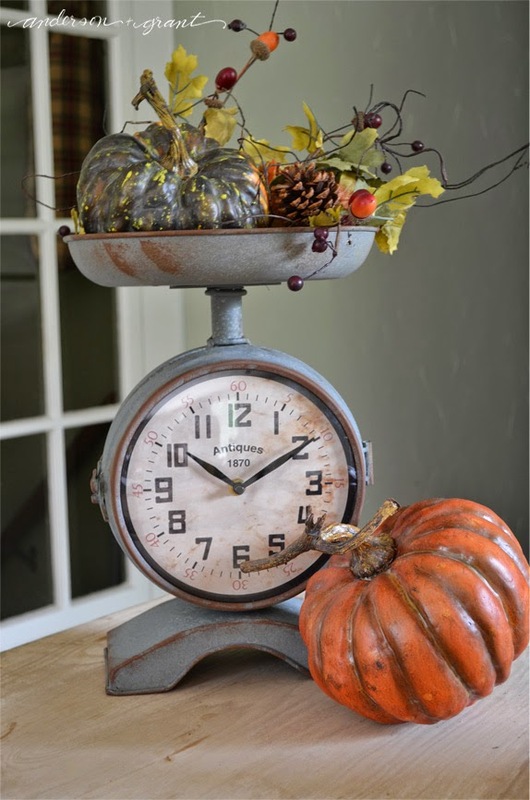 If you have a vintage scale with a flat top, you could add a bowl or basket to hold pumpkins. Or just rest a single pumpkin on the top. 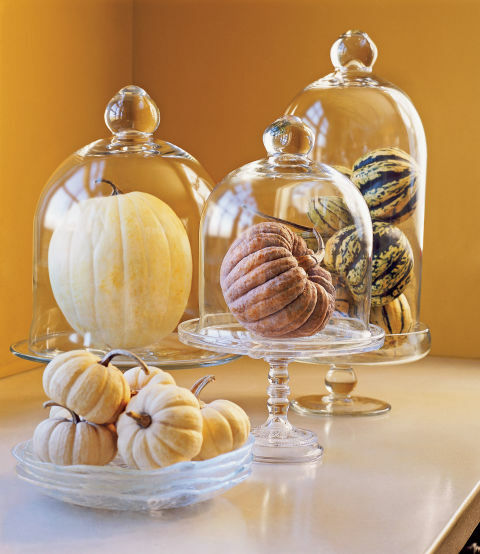 Placing a single pumpkin under a glass cloche instantly makes the pumpkin seem more important and noticeable. You can also gather many smaller pumpkins under the dome. 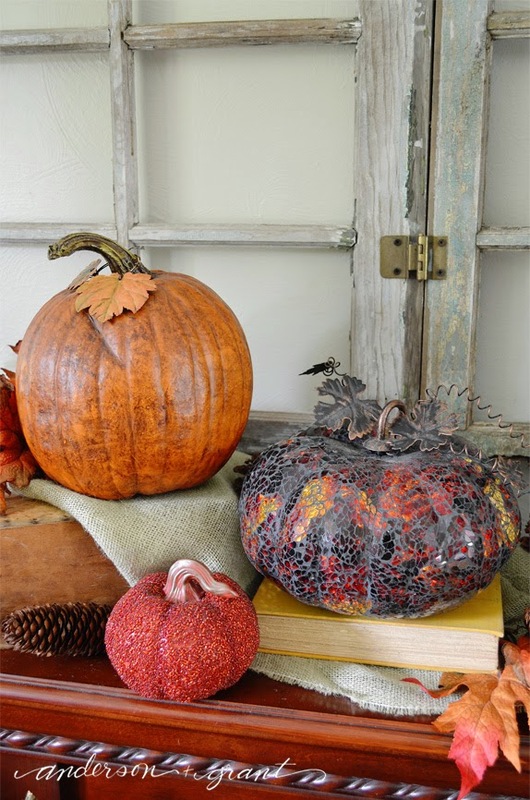 Pumpkins can be mixed and matched in a group as long as there is a common characteristic between them. These pumpkins are very different, but all three are shades of orange. You could mix pumpkins of different colors if they are the same size or style. There are always great decorating ideas coming from French Country Cottage and this one is no exception. 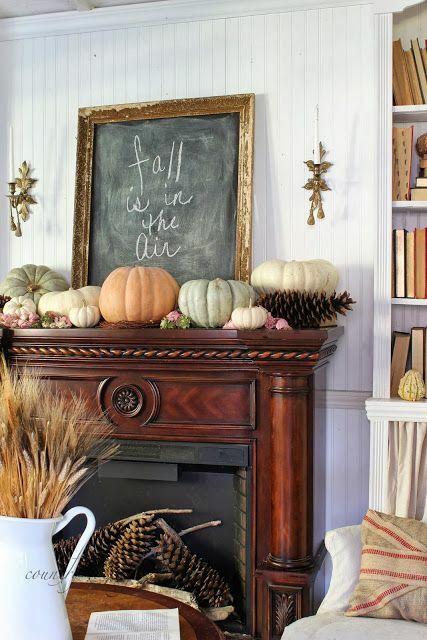 The entire mantel has been lined with different colored pumpkins with just a few pinecones and flowers tucked in. The pumpkins are the focus. If you don't have a mantel, you could always line a shelf or do a display down the center of your dining table. I love old (or reproduction) dough bowls. They look so nice filled with pumpkins, leaves, pinecones, or berries. I really love this display with the green pumpkins and gourds. It is so simple, yet looks complete. 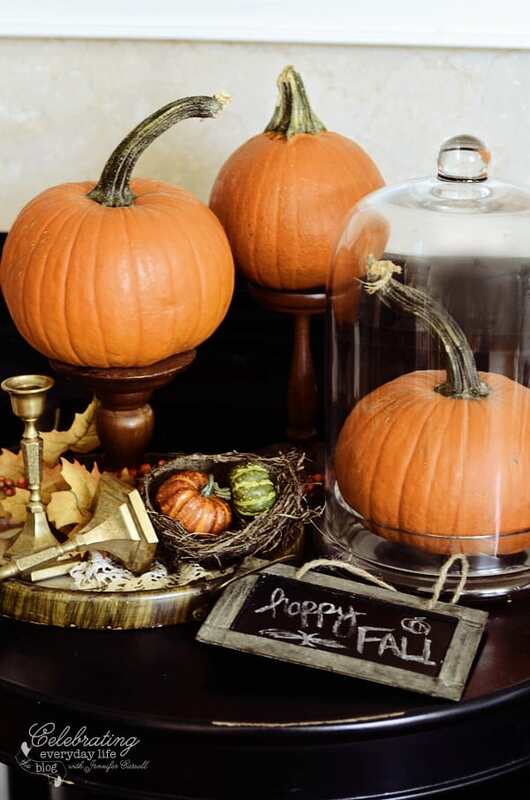 An easy way to create some height in a fall display is to raise the pumpkins up on candlesticks. You can do this with a single candlestick or use a variety of heights and sizes for a big display. 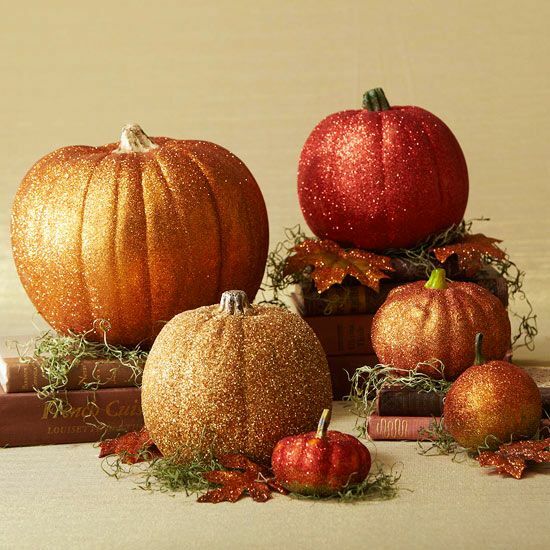 Not only are these glittered pumpkins beautiful, but layering them on different size stacks of books draws your eyes through the whole grouping. The addition of the green straw and glittered leaves completes the display. 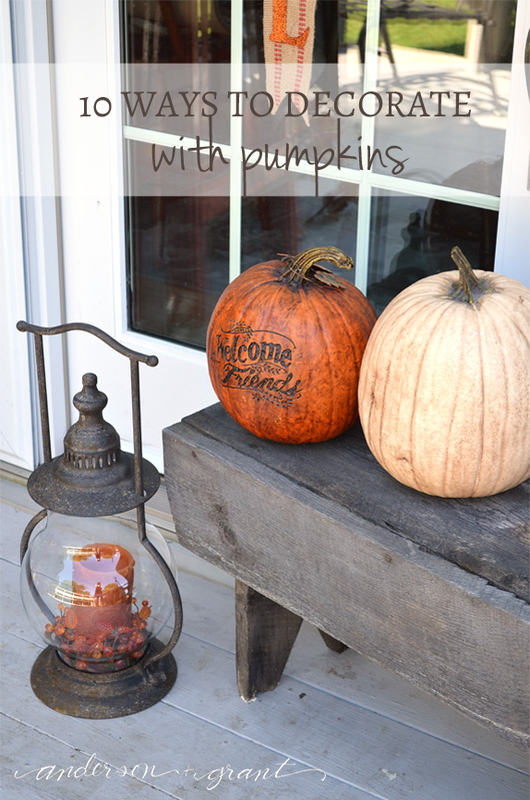 Now that I've shared my ideas for using pumpkins in your fall displays, what ideas do you have? 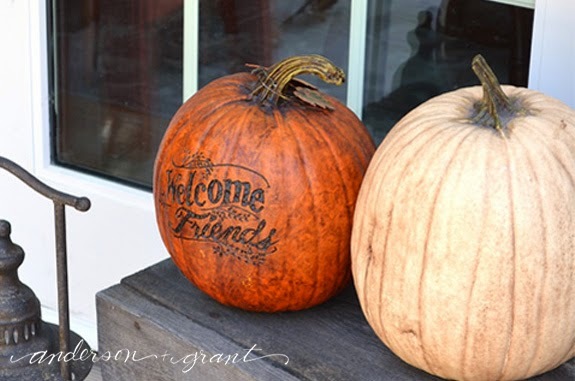 How have you decorated with pumpkins this year?